We are working on slope in my Fundamentals of Algebra classes. In my Laying the Foundation/NMSI training last year the leader recommended using piecewise graphs as a natural way to compute slope repeatedly and to provide opportunities to compare slope. Today I did just that! 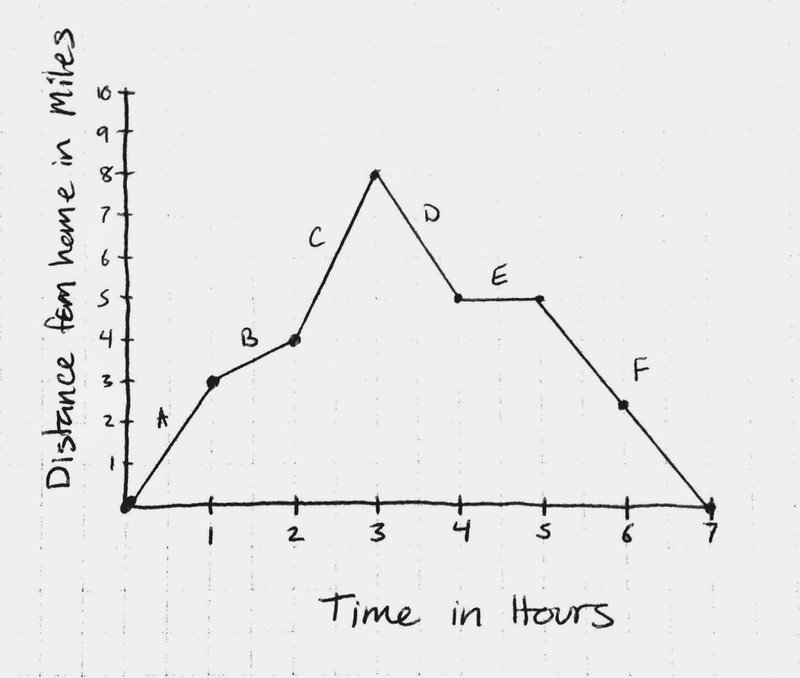 I gave my algebra students the graph below, without a story or any questions to answer, and asked them what they noticed and wondered. words even if I pick up the pen between them. A student added the 7 hours observation during our discussion later. Once I had everything recorded, I asked them to be more specific. "Someone said 'It is increasing' what is 'it'?" I pushed them until they read the entire label on the y-axis. Then I asked, "What does that mean?" Someone would realized that the person is walking away from home. To drive the point home I pointed to the graph - "This isn't a mountain. They aren't necessarily walking uphill. The graph is telling you distance from home, not height." I continued to pull together their various noticings and wonderings until they had a complete picture. I was so impressed that when I asked one class about their "goes positive, then goes negative" observation they identified that as positive slope and negative slope! These Transitions to Algebra workbooks from EDC just might be working! I shared that this type of graph is called piecewise in response to their wonderings (What are the letters? Why would it be non-linear? Can there be more than one slope? ), and told them that their task would be to find the slope of each piece. Then I apologized for my failure to photocopy the blue grid lines and we filled in the distance table as a class. Except I skipped 6 hours so they would have to figure that out independently. Then I sent them on their way to complete the rest of the task. I was so happy that they managed to figure out the story with little prompting and answer several of the questions on the handout before they even got the handout with the story and questions! They were eager to get to work on the handout when they did get it because they already understood the context. It was awesome.